Imagine technology so advanced that it may help stroke and other neurological patients regain lost mobility and achieve greater independence than they believed to be possible. This highly sophisticated technology is now a reality. Central nervous system injuries often result in foot drop—leading to instability and difficulty walking. The NESS L300™ is a revolution in Functional Electrical Stimulation (FES) technology, designed to help patients who experience foot drop to regain mobility and help “normalize” walking and gait. 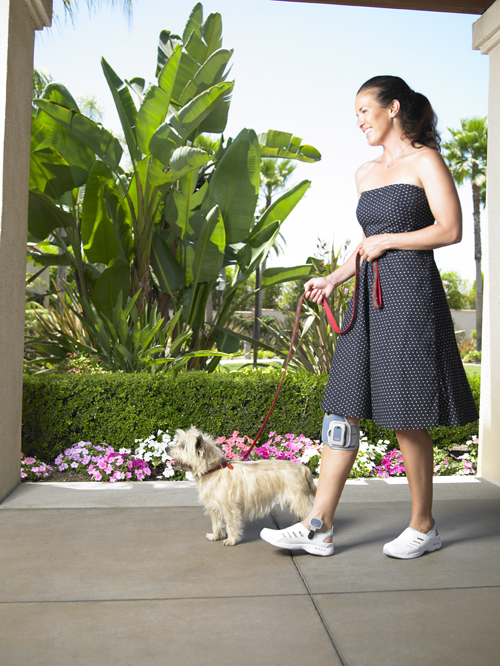 The L300 uses wireless communication to “talk” to its components, eliminating cumbersome wires, and allowing the clinician the ability to fine-tune settings while the patient is actually walking. This user-friendly system is appropriate for a broad range of conditions, including stroke, traumatic brain injury, multiple sclerosis, cerebral palsy, and incomplete spinal cord injury. 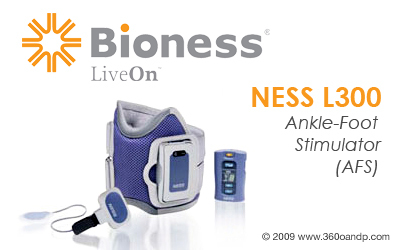 The NESS L300™ is a unique lightweight Ankle-Foot Stimulator (AFS) worn on the lower-leg in place of a traditional foot brace. Sensors detect whether the patient's foot is in the air or on the ground, and electrodes transmit low-level electrical stimulation to the peroneal nerve to activate the anterior tibialis and peroneal muscles and improve their gait. This system is engineered to produce optimum therapeutic benefits for patients, while simultaneously creating minimal disruption to daily life. The unique design allows the clinician to custom-fit each Functional Stimulation Cuff ensuring maximum patient comfort. The simplicity of the system enables patients to apply and remove it when necessary. The simplicity of the NESS L300 system also encourages more frequent use, which can help facilitate greater patient compliance. The NESS L300 is being used throughout the country with positive results in Orthotist and Prosthetist clinics, rehabilitation settings, as well as in the home. Through these and other medical innovations, Bioness strives to deliver advanced technologies that help patients and families address the effects of neurological disorders. For more information, please contact us at www.bioness.com.